In this gallery of modern driveways you’ll find a variety of materials, designs and ideas for inspiration. A custom driveway design can enhance the beauty and curb appeal of your home. These pictures feature a variety of driveway styles, and materials to showcase some of the types of surfaces popular today. 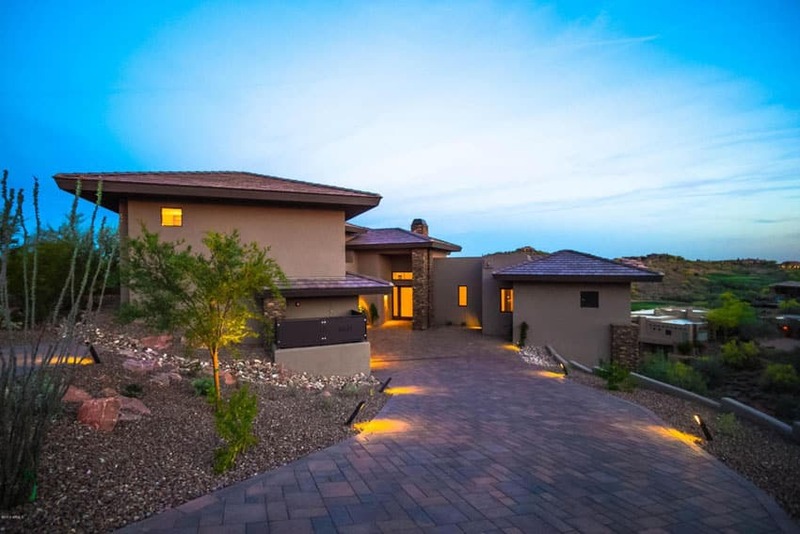 Some of the most popular types of driveway materials in use for luxury homes right now are, asphalt, concrete, gravel, brick pavers, slate, and cobblestone. Each type of material has pros and cons which will be discussed below. 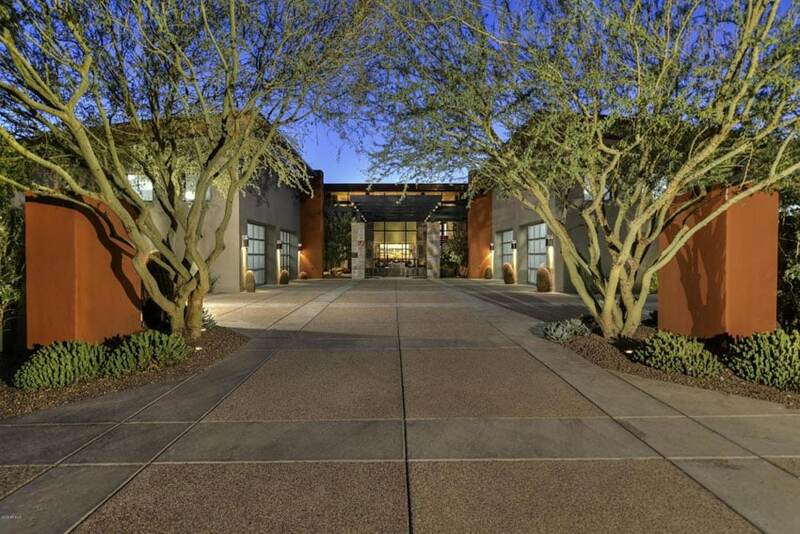 In the image above a beautiful cobblestone paver driveway leads past wrought iron gates and landscaped hedges to the luxury home’s grand entrance. Cobblestone pavers, also known as Belgian block pavers make a great choice for drives as they are attractive, low maintenance and durable. Cobblestone comes in a variety of colors. The downsides to cobblestone driveways are they can be expensive and they are not perfectly smooth which can make it a challenge to clear snow if used in an area with a cold climate. A contemporary home with a city view, stacked stone wall, wrought iron fence and irregular square concrete driveway looks stunning and inviting. Concrete can be an extremely durable driveway material that’s long lasting. However, concrete is more expensive to install than asphalt and can be adversely effected by extremely cold weather. 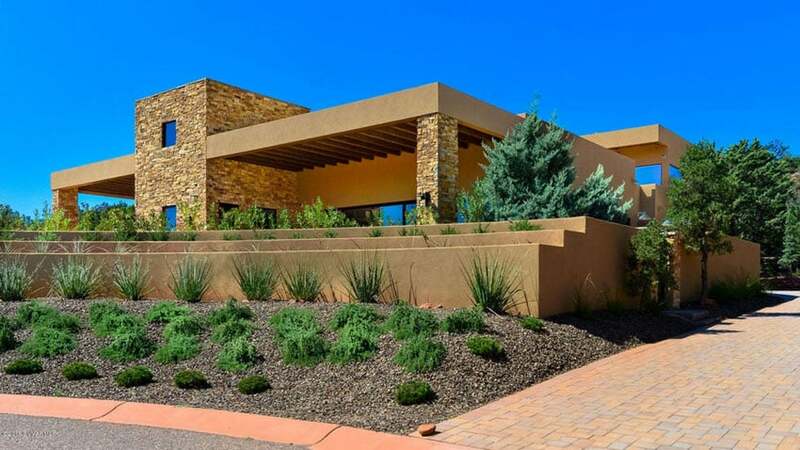 Since concrete is widely used there are many different ways to customize its look, color and surface to get just the design you want for your home. 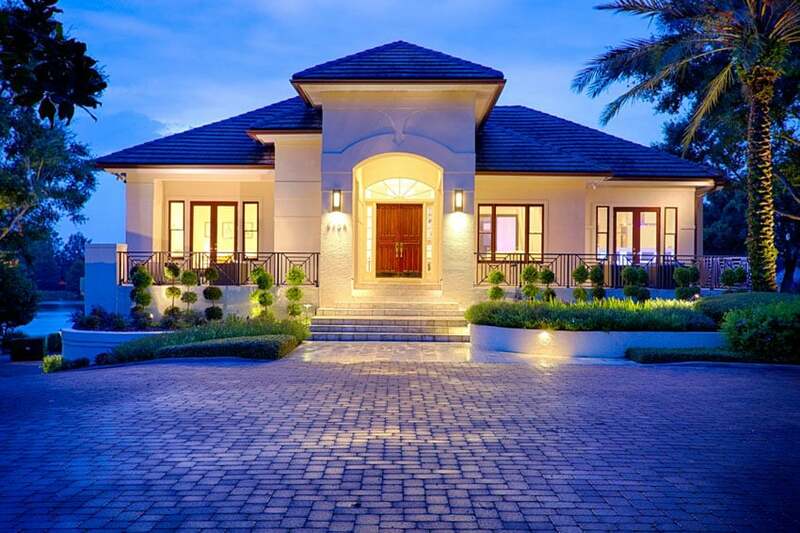 This gorgeous luxury home features an amazing circular driveway with pavers that are covered by a sealer to give it a high glossy sheen. 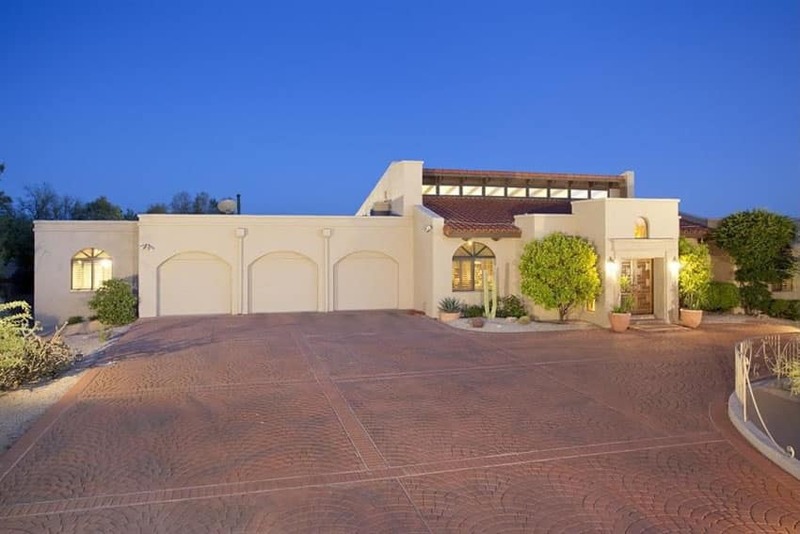 The drive wraps around a stunning water feature with multiple fountains and is surrounded by a lush tropical garden with a walkway leading to the home’s front entrance. 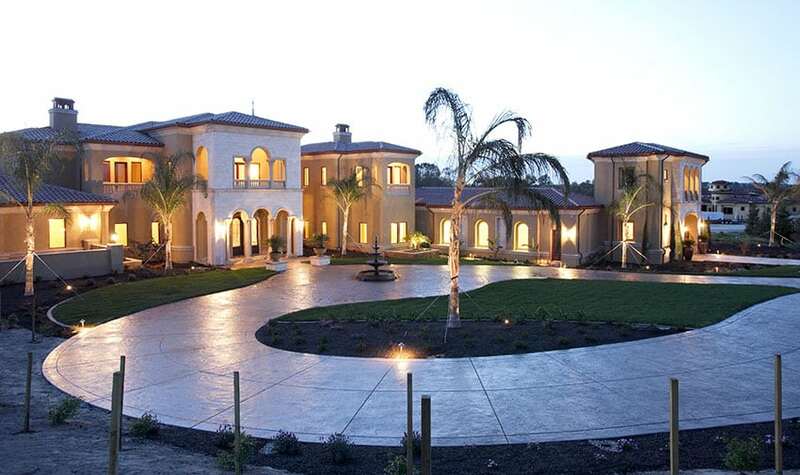 This luxury home features a beautiful stamped concrete circular driveway that winds around a large central fountain. 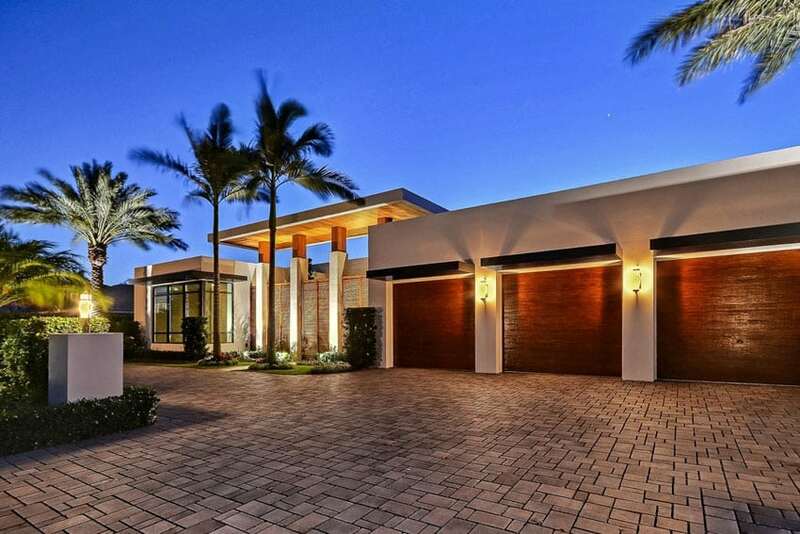 The landscaping surrounding the circular driveway consists of grass, flowering plants, and tropical palms. 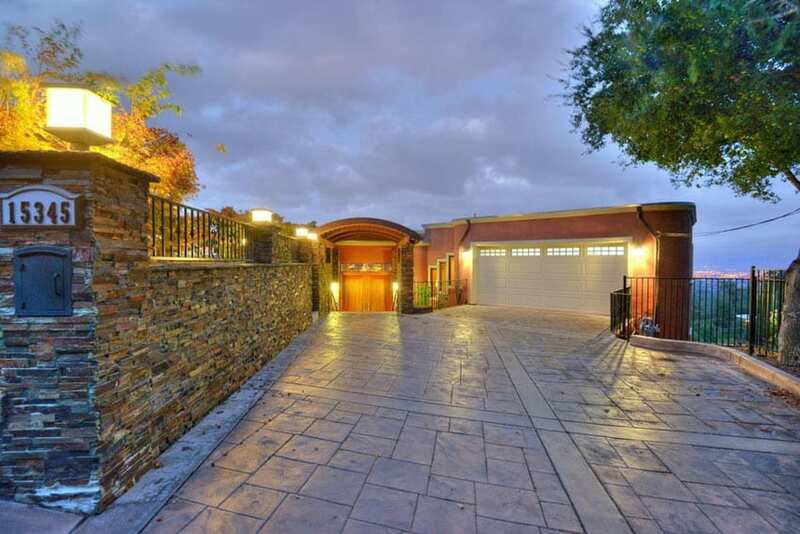 The prestigious estate home has a circular driveway with gray pavers and concrete that wraps around a central island with small hedges. The driveway also slants off to an underground garage to the side. Custom design circular driveway using different color brick pavers with concrete side forms. This durable paver driveway has a poured concrete design with irregularly shaped pavers in the middle. 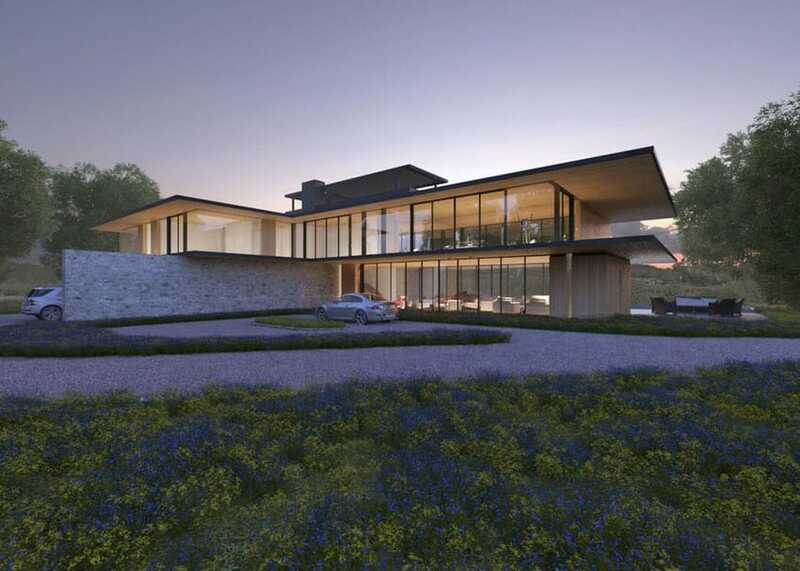 The resulting design is an attractive and elegant choice for modern houses. 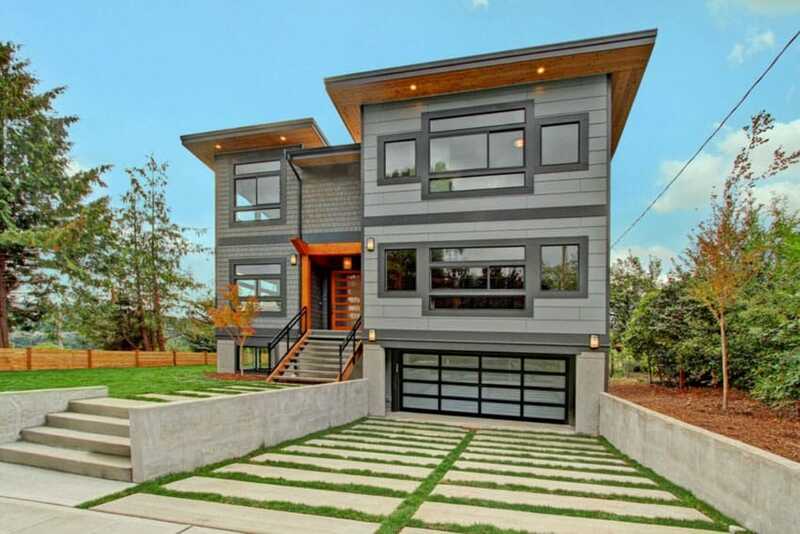 A modern home with brown concrete pavers in a random pattern design looks great and makes an impressive first impression for visitors to this home. A brick paver driveway design with a tree positioned in the middle. 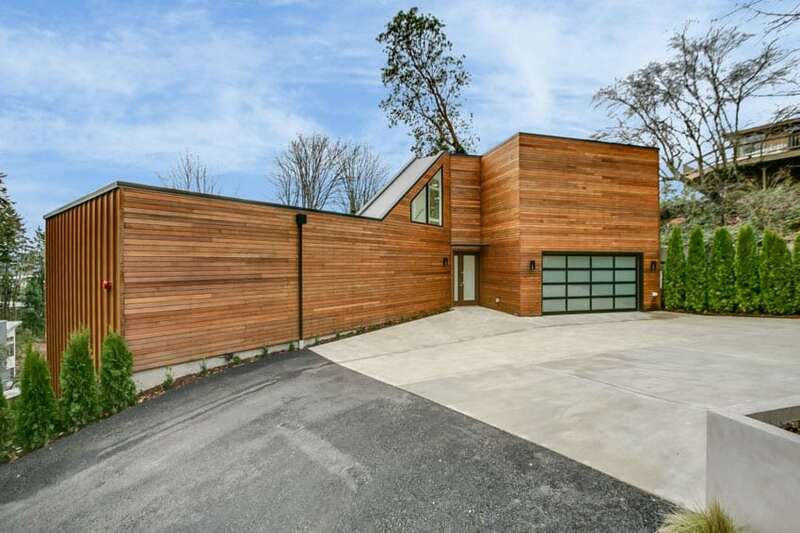 One can only speculate that the tree was there before the house, and the owner liked it so much they decided to build the drive around it. Modern driveways often use brick pavers. 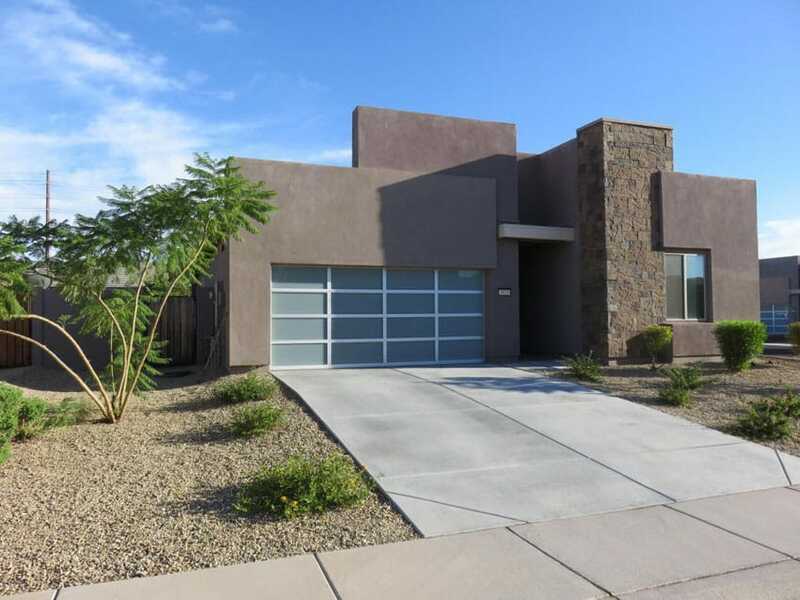 This house features stucco architecture with stacked stone pillars and walls, with bark landscaped yard and brick paver drive. This modern home’s front yard and landscaping is dramatic and appealing and the bricks match well with the aesthetics of the exterior. This modern home has an interlock paver driveway that carefully fits together to create a stunning impression. Sand is poured between the stones to help keep them from moving and as long as the base is constructed well the pavers will not settle or move due to freezing and thawing weather conditions. 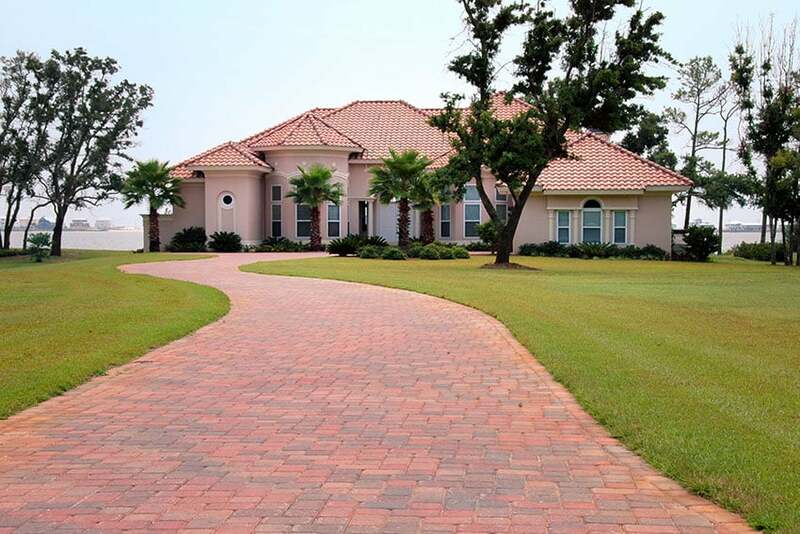 This red and charcoal accent brick driveway looks elegant as it winds its way to the home. With irregularly sized interlocking bricks it is easy to get a classic look and design. Winding brick driveway leading to waterfront home. This slate tile driveway looks amazing with its irregularly cut stones and interesting color combinations. Slate can be slippery and may not be the best choice for area with a lot of rainfall or when used on a sloping driveway. This home’s custom brick driveway looks stunning with its decorative patterns of rounded semi circles separated by square edges. 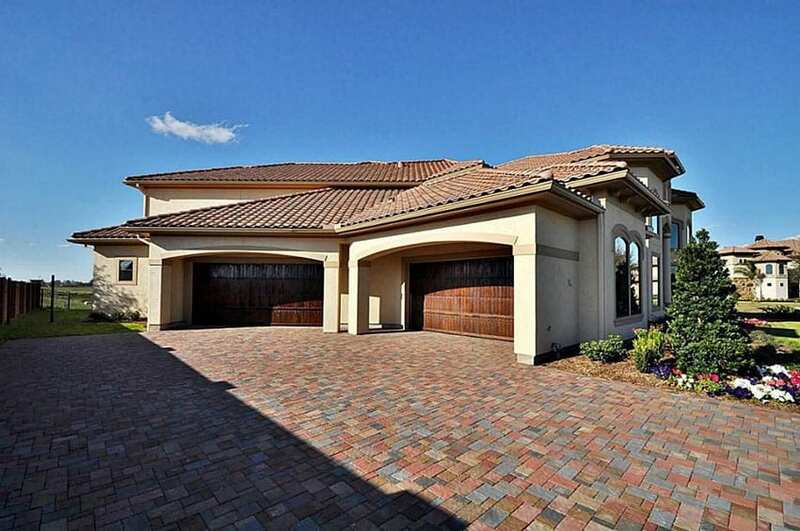 A custom brick drive offers elegant curb appeal that is contemporary and stylish. 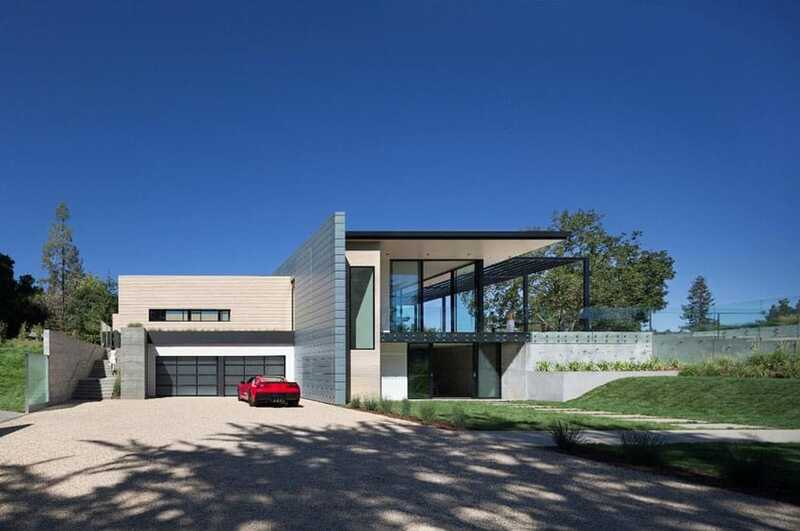 This modern home has a concrete and aggregate driveway. This style is often called exposed aggregate since the stone chips or gravel are partially exposed to the surface. A broom finish is usually used on a driveway to give it slip resistance. Aggregate drives are eye appealing, durable and one can add different colors and textures to get the look desired. 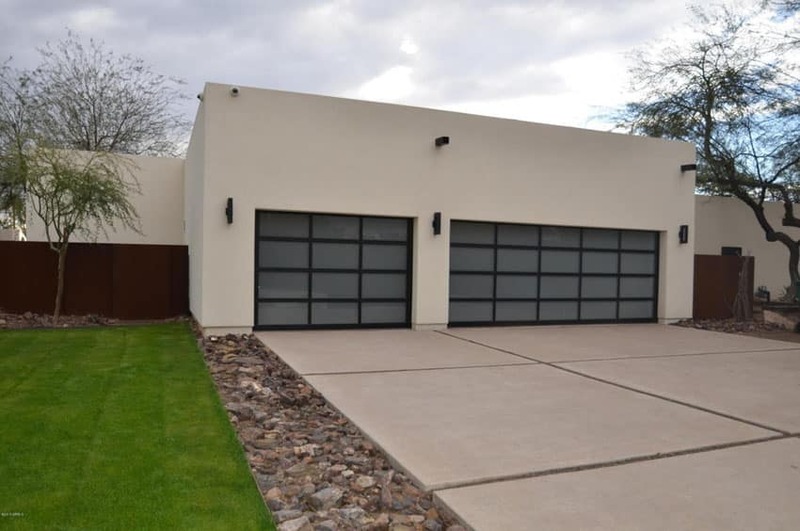 A modern house with smooth concrete driveway poured in squares helps provide drainage and looks stylish. A border of rough rock separates the driveway from the lawn area and enhances the appearance of the front yard. This concrete driveway leads to a modern home and is surrounded by a low maintenance rock yard with drought resistant plants. 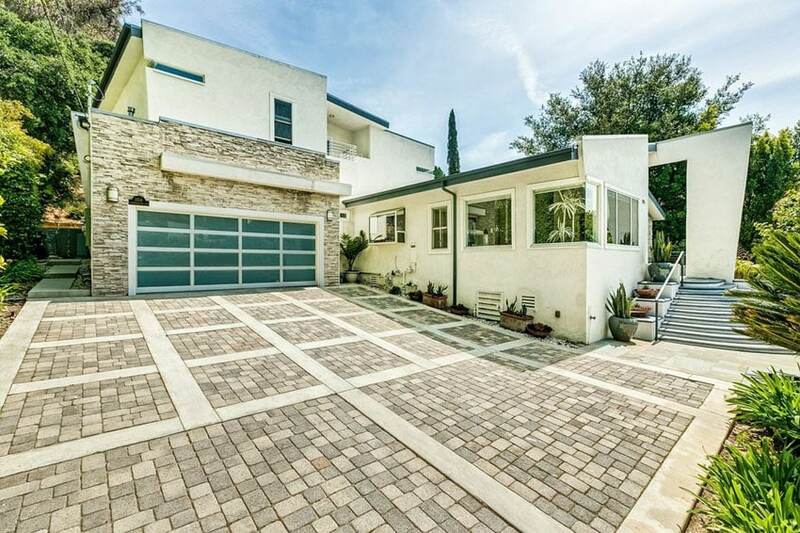 This house has a modern patterned driveway with concrete surrounding small stone pavers. 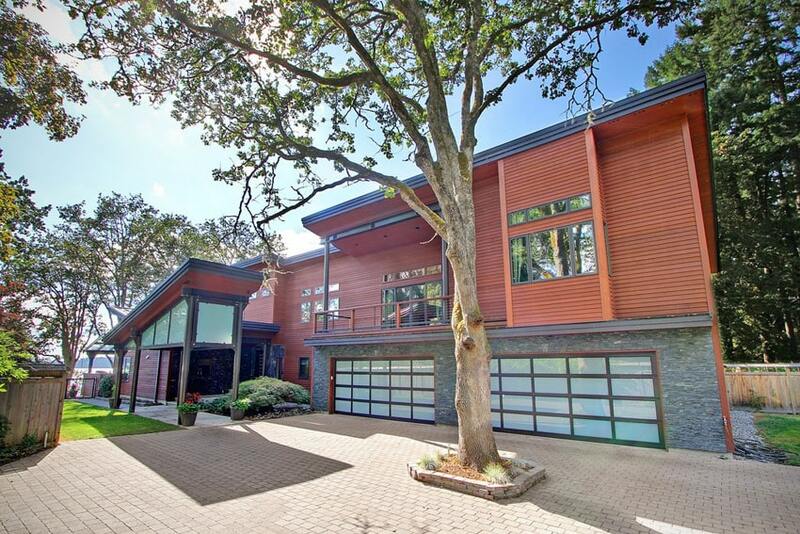 The geometrical style goes perfectly with the home’s modern architecture. This driveway is asphalt leading up to a concrete slab. Asphalt driveways are quick and easy to install, inexpensive when compared to other materials. However, asphalt does need to be resealed every 3 to 5 years and due to gravel being loose it may not be ideal for areas with a lot of snowfall. 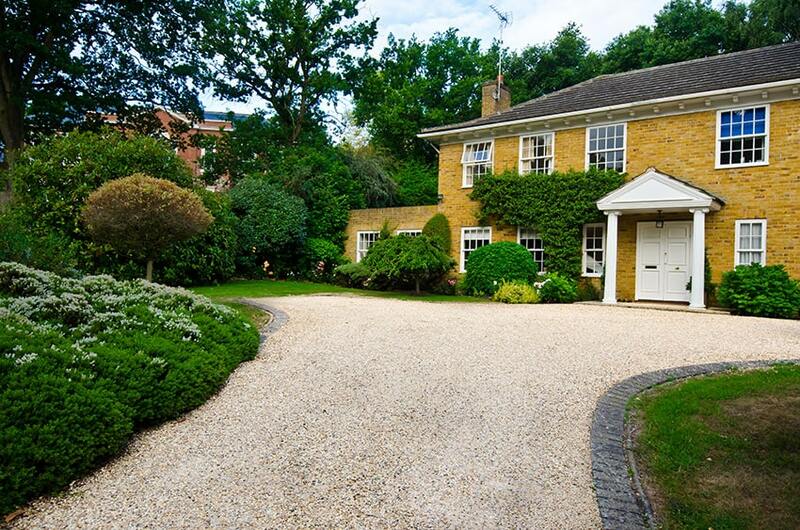 This charming countryside house in England has a loose gravel driveway framed by gray paving stones. This driveway design is low cost and offers easy maintenance and can last for a long time. Loose gravel driveway at country home. Before you spread gravel to create a driveway like this make sure to prepare the ground. you’ll want to make sure you have a hard surface without any topsoil. In addition make sure your surface has adequate drainage and side forms to keep the gravel from spreading outward. Gravel driveway leading to small cottage house. 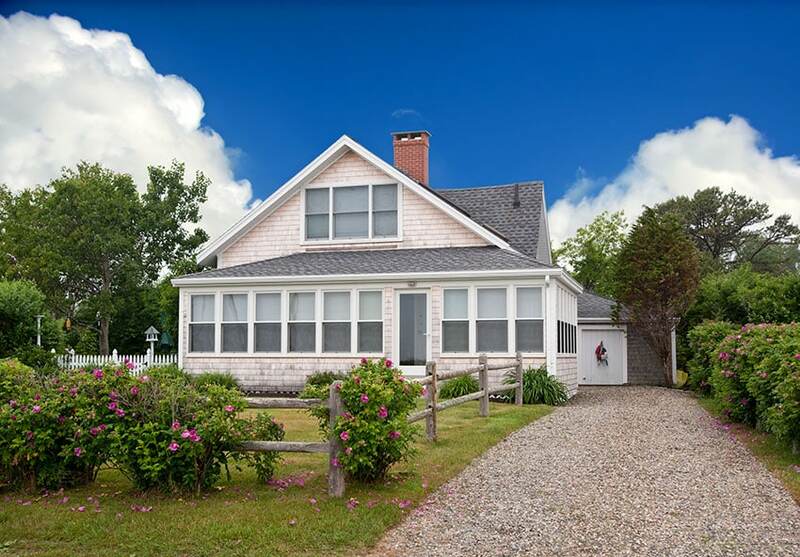 This modern home features a curving tar and chip driveway with grassy islands and beautiful flowering garden. Tar and chip driveways are primarily constructed with asphalt in liquid form and stone. they can be inexpensive to install and provide a lot of traction for cars. The downside to tar and chip is then can require maintenance if you live in an area with snow removal requirements. Otherwise they may need to have another layer added after about 7 to 10 years of use. another form similar to this is a crushed shell driveway which uses little pieces of clam, scallop and oyster to create a more eco-friendly choice. Another example of a modern home with tar and chip paving. 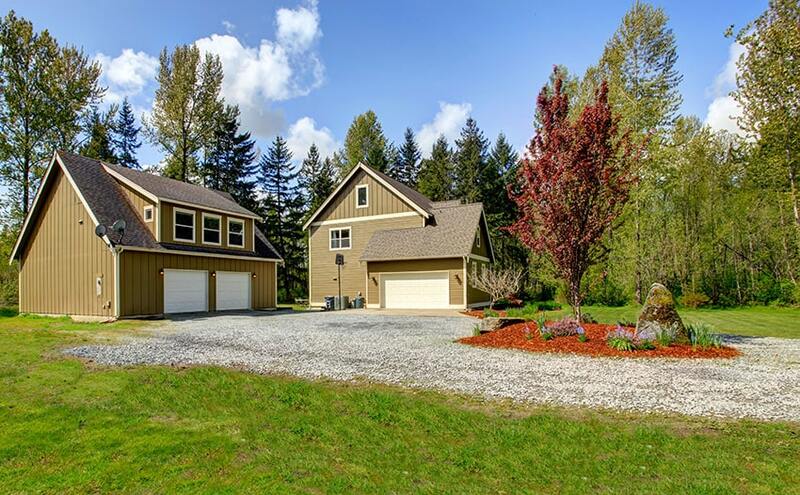 The tar & chip driveway leads to the two car garage and is an excellent alternative to a traditional asphalt driveway. Visit this page to see more types of driveways for the home.